Thanhouser spearheaded the effort to mark La Badie’s grave after he was notified on Facebook of the actress' presence in Green-Wood. He raised $3,100, which was matched by the cemetery to commission and install the headstone. At the ceremony, Thanhouser read a quote from a 1914 issue of Blue Book magazine, in which silent film director Howell Hansel said of La Badie: "She'll do anything I ask her to. If I were to say to her, 'Miss La Badie, go and jump out of that window; there'll be someone down below to catch you,' she'd do it without even going to the window to look out to see. She's pure steel." 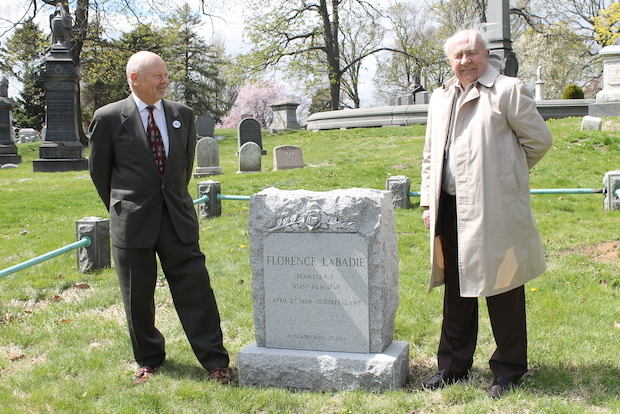 After unveiling La Badie's headstone Sunday afternoon, fans and film buffs celebrated her life by sharing coffee and cookies, and watching portions of her films at Green-Wood’s chapel.